Fantastic Beasts and Where to Find Them is Written by J.K. Rowling, and directed by David Yates. Walking into the theatre, I felt it would be impossible for this film to be great. The Harry Potter franchise yielded eight films that most will consider to be an amazing achievement on their own, so how could a spin-off film continue that momentum? Well, surprisingly enough, it does and in a very satisfying and exciting way. Written by the wiz J.K. Rowling, her first screenwriting project, and directed by series favourite David Yates, the film will more than please fans and those wanting an all around fun film. 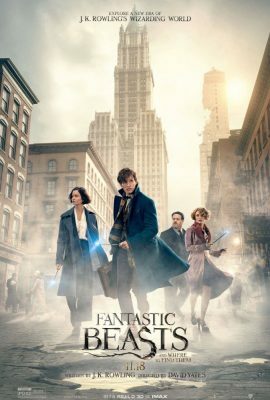 Taking the world many know back to 1920s in New York, we follow the young wizard Newt Scamander and his suitcase full of beasts as he finds himself on the wrong end of the law and on the search for several of his creatures. The cast is exquisite in their portrayals with Oscar-winner Eddie Redmayne as Scamander, providing a quiet and thoughtful performance that contrasts Daniel Radcliffe’s younger electricity. In particular Katherine Waterston and Dan Fogel as Tina Goldstein and Jacob Kowalski are layered, funny and integral to the feeling of the film. The so-called beasts of the film are rendered astonishingly by continuing the visual splendour of the past series, the CGI and animation work accomplished in the film must be mentioned by the sheer amount of hours that must have been put in to make the world feel so tangible. It’s that tangibility that stands as the film’s, and Rowling’s work as a whole, the greatest strength of the film. The characters and setting is lovably crafted and sprawling to invite the spark of imagination and wonder. One hiccup that must be noted is that the film’s opening moments are extremely fast paced. On a second viewing, I am sure that they would congeal with the rest of the film but at first glance, they are somewhat cryptic with their fast cuts and the dizzying 3D effects, which are also surprisingly well used. Rowling’s definitive creation still seems to bound with creativity and Fantastic Beasts should be the example of her aptitude to create breathtaking and intimate character stories. One aspect I certainly admired is the infusion of a noir and seedy underbelly to the setting, further layering the magical world with a grittiness that hasn’t been seen before, adding an exciting avenue to see where the four upcoming films will take the series.